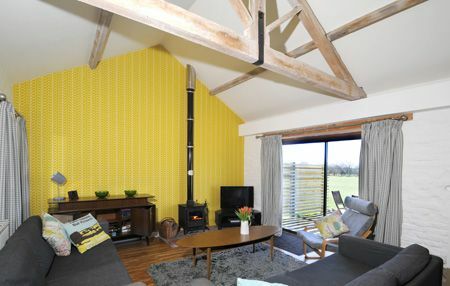 Swallow cottage is a single story converted dairy barn overlooking farmland and enclosed gardens. The property has a welcoming wood burning stove with complementary logs for cosy winter stays.Guests have shared use of our luxury indoor heated pool, tennis courts and games room. We had a lovely stay - the house is beautiful and very well equipped for a family with young children. The facilities (pool, play area) a huge bonus and location is perfect for exploring the North and East Norfolk coast. We will be returning! Enjoyedo our stay here as the cottage and facilities are so child friendly and staff is very helpful. The cottage does have everything we needed and it was laid out to our specifications on arrival which is refreshing! A very relaxing Nov. week spent here with 3yr old and 6 mth old in tow. Excellent facilities with the pool a favourite with the three year old esp on days where outside play wasn't an option. Cottage was very clean and staff were extremely helpful. Would recommend Carpenter's Arms in Wighton and Victoria in Holkham for excellent pub meals and Holt/Sheringham steam railway. It was so great - we went twice. And we’re going again. Attention to detail makes this place a model for self catering accommodation. Fantastic properties and ideal for large groups including children. Everything was perfect, from the booking through to the arrival and actual stay. Zoe was a delight to deal with and couldn't do enough for you. If I was being picky the only negative, because we had young children with us, was reception was non existent and wifi was poor but we were warned about this.